This entry was posted in Seasonal and tagged bread, couplets, crows, mating season, spring. Bookmark the permalink. Such lofty praise — thank you, Beth Ann! This is wonderful. 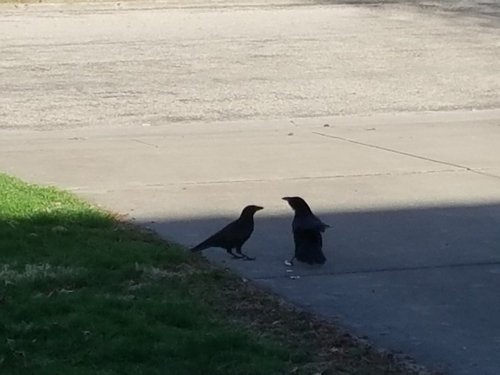 It’s the season, and our grackels are making perfect fools of themselves while they sort out who to build their nest with. Love the photo, and love the dialogue even more. Beth Ann’s right — it’s perfect! Thank you so much, Linda. ‘Twas loads of fun doing this one, and a little part of me hopes the crows would agree with you! OMG Debbie, what a sweet, sweet post! LOVE the photograph! And it’s funny but the bird on the right almost looks like a tiny penguin! As usual, well done, my friend! Ha ha ha. Debbie. Super poem. Thank you, John — delighted you found it enjoyable! I’m thrilled to make you laugh, FF — just consider it payment returned for the number of times something you’ve written gives me cause to chuckle! Love that poem Deb. I needed a poem for our Good Friday service. I looked for poems on line and asked someone to write one. I finally wrote one myself. I’m not a poet but I did it. Right in time for poetry month. Who knew I could do it. Your poem made my day! Thanks! I have no doubt your poem was perfect, Tanya — congrats! And just know that’s the way a lot of us start writing, whether poetry or fiction. We can’t find something that says what we want the way we want it said, so we do it ourselves!